Shel Silverstein's most popular book, Where the Sidewalk Ends, is now available in a special edition containing the classic hardcover book and a CD of highlights from his Grammy Award-winning album. This is a wonderful gift and keepsake for Shel Silverstein fans, old and new. From the outrageously funny to the quietly affecting--and touching on everything in between--here are poems and drawings that illuminate the remarkable world of the well-known folksinger, humorist, and creator of The Giving Tree, A Light in the Attic, and many other classics that continue to resonate. 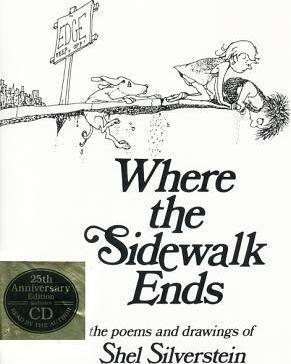 To celebrate the 25th anniversary of Shel Silverstein's most popular book, Where the Sidewalk Ends is now available in a special edition containing the classic hardcover book and a CD of highlights from his Grammy Award-winning album. This is a wonderful gift and keepsake for Shel Silverstein fans, old and new. From the outrageously funny to the quietly affecting -- and touching on everything in between -- here are poems and drawings that illuminate the remarkable world of the well-known folksinger, humorist and creator of The Giving Tree. "A zesty collection of humorous light verse." -- "SLJ. ""An ideal book for teachers to have handy . . . If you want to ungloom your day, start Where the Sidewalk Ends." -- "Reading Teacher."